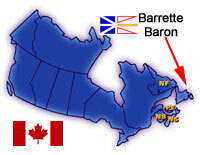 BarretteBaron.com is located in Canada, Marconi received the first telegrahic transatlantic message in 1901 at famous Signal Hill, it is also the home of North America's oldest sporting event "the St. John's Regatta", One more tidbit... Newfoundland celebrated the 1000 year anniversary of the Viking Landfall in L'Anse aux Meadows in 1999,...and the list goes on.. The movies Shipping News and Rare Birds were also recently filmed in Newfoundland. Be sure to keep coming back to this site as I am always adding new products and designs to my product line.